New Tires! LT Crew Cab, 4x4! Z71 package, Tow package, Bluetooth, Back up camera! LT Crew Cab, 4x4! Z71 package, Tow package, Bluetooth, Back up camera! New Tires! RDU Auto is for the Price Concious. Non Commissioned Staff. Up front, below market No-Haggle price on every car. Request a Test Drive at your work during break. Free Home Delivery in Raleigh, Cary, Apex, Garner. Nationwide shipping available. 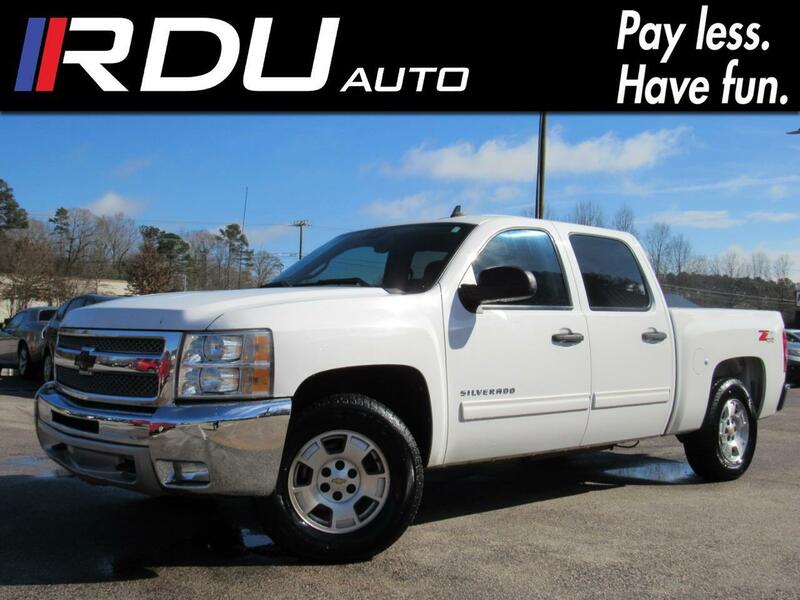 Best price guaranteed on all used cars, trucks, vans and suvs in Raleigh, North Carolina. Hablamos espanol! Please verify all options, mileage and availability with one of our staff members.Test drives may require proof of funds or pre approvals on any sports or luxury cars. We have taken many things into consideration when pricing the cars, exterior condition, miles, interior condition and warranty etc. No car will be held unless with a non-refundable monetary deposit. Not all vehicles include extra keys, floor mats, or owner manual. Most vehicles include include a 90 day, 3,000 mile limited warranty (see dealer for details). Some of our vehicles are still covered under the original factory warranty and are therefore sold with the balance of that warranty in place.There are also other exclusions such as, but not limited to: V10's, Electric cars, diesel engines and others, all British vehicles, Exotic and Performance vehicles. Some of our vehicles are sold AS-IS, this means that the buyer is responsible for all repairs. We accept all major credit cards, there is a 3% convenience fee on total purchase price.